The perfect pens for your field work. They write at any angle in all weather and temperature conditions with waterproof ink. They mark on all papers and fieldbooks sold in the Geology.com Store. Don't take chances with your important notes. If you are writing on waterproof paper, you should be using an ink that will not wash off. Specially designed mechanical pencils also available. The rubber-coated Space-Tec waterproof pen has a cushioned barrel and grip. This pen will write at any angle or temperature with black waterproof ink. 5 3/16 inches in length. With a non-reflective black matte finish, this metal pen was designed with the military in mind. Writes at any angle in any weather conditions in black waterproof ink. 5 3/16 inches in length. This refill fits any waterproof pen sold on this page. Refills write upside down, at any temperature, and in any weather, just like the cartridges that are included with the pens. These mechanical pencils were created for use in the field. Made with a strong resin barrel that is built to last. 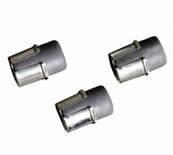 They have broad, hard leads which resist breaking. 5 3/4 inches in length. Includes six extra leads and two extra erasers. This is the same pencil as above, but with a yellow barrel. Includes six extra leads and two extra erasers. This is the same pencil as those listed above, but with a red barrel and red lead. Includes six extra (red) leads and two extra erasers. 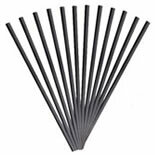 Set of 12 black leads for the mechanical pencils sold above. Hardness of HB (No. 2). 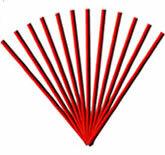 Set of 12 red leads for the mechanical pencils sold above. Hardness of B (No. 1). Set of 3 erasers for the mechanical pencils sold above.